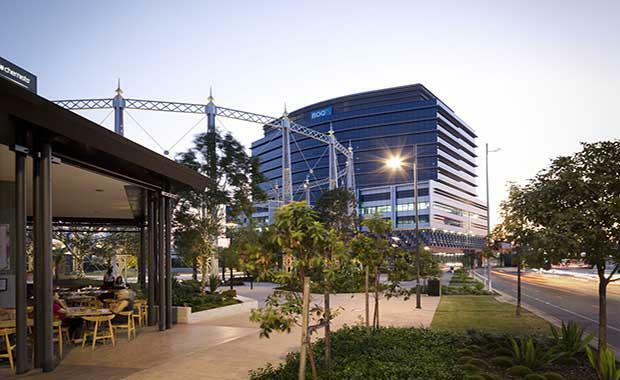 Newstead in Brisbane is home of the newest innovative office space that spans across 12-storeys and 2,200 square metres. The up and coming suburb is home to leading Australian businesses Energex, Leighton Contractors, Bechtel, Virgin, AECOM, Macquarie Bank and Australian Agricultural Company, and will soon be home to the national headquarters of Tatts Group. 100 Skyring at Newstead’s Gasworks later this month. BOQ has taken five floors at the $175 million, A-Grade, 12-storey building, which will be home to around 960 BOQ employees. The bank has also secured the naming rights for 100 Skyring. BOQ’s Acting Chief Executive Officer, Jon Sutton, said the new headquarters at 100 Skyring would provide a highly flexible working environment for employees and aid BOQ’s customer-first approach. “100 Skyring delivers large, open floor plates that we’ve been able to use to create a flexible layout that embraces technology, promotes increased employee productivity and delivers various meeting areas to encourage workplace collaboration,” he said. “Each floors’ shared facilities including meeting rooms, kitchen and breakout areas, create a strong sense of community, with the office’s main focal point – the five-floor atrium stair space – connecting employees between floors and encouraging greater communication." Mr Sutton said that due to changing needs of customers the workforce needs to be more flexible and mobile. "The size and adaptability of the 2,200 square metre floor plates at 100 Skyring were crucial to creating the innovative work environment we wanted," he said. “While we considered a range of relocation options, 100 Skyring was the clear choice for us. Located within the new Gasworks precinct at Newstead, it provides easy access to public transport and other amenities, such as cafes, shops, bars and restaurants. Charter Hall Regional Asset Manager, Belinda Kalinin said 100 Skyring offers a dynamic and contemporary workplace in an activated precinct that sought to provide a vibrant work-lifestyle. “We believe the rapidly improving amenity and campus-style opportunities provided by the Brisbane fringe has major appeal for organisations looking to renew themselves in a contemporary and innovative business environment,” she said. “With easy access to the City Cat, City Glider, ferries, train stations and bike paths as well as retail, cafes, bars and shopping, the precinct offers a variety of quality choice in a vibrant location, only 1.7 kilometres from the CBD. According to Ms Kalinin, Newstead is setting the benchmark for future Brisbane office communities. “As the developer, owner and manager of the building, we are now focused on getting BOQ and other tenants into the building and leasing the balance of the remaining office space. There has been a strong level of interest in this brand new product,” she said. The building reached practical completion three months ahead of schedule in August this year, which has received a 5 Star Green Star – Office Design v3 rating, and is targeting a 4.5 Star NABERS Energy rating. BOQ will be joined by fellow tenants including Redchip Lawyers and Konica Minolta, leaving over 35 per cent or 8,000 square metres of contiguous office space available for lease on the top four levels of the building. 100 Skyring also features ground floor retail as well as generous lifestyle facilities, with 192 bicycle racks, showers, change rooms and lockers.